Be the first to share your favorite memory, photo or story of Clinton. This memorial page is dedicated for family, friends and future generations to celebrate the life of their loved one. 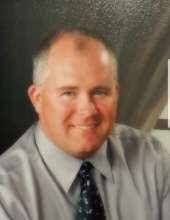 Clinton Ray Alvin Springer, age 46 of McDowell, Kentucky, passed away on Thursday, January 24, 2019 at his residence. He was born September 16, 1972 in McDowell, Kentucky to Clinton D. Springer of McDowell, Kentucky and the late Nina Nadine Poston Springer. He was the husband of Michelle Cook Springer. He was a retired engineer for the Commonwealth of Kentucky and member of Prestonsburg Church of Christ. Along with his father he is survived by his Children: Brittany Rae Springer (Anthony Hurt) of Prestonsburg, Kentucky, Laken LaShade Springer (Robert Hall) of McDowell, Kentucky & Dustin Blake Tackett of McDowell, Kentucky; Granddaughter: Aralynn Rayne “Monkey Tail” Allen; Brother: Drexel (Kristina) Springer of Prestonsburg, Kentucky; Brother in laws: Earl (Belinda) Cook of Drift, Kentucky & Eric (Stacey) Cook of Langley, Kentucky; Mother in law: Brenda Cook of Minnie, Kentucky. He will be missed by all that knew and loved him. "Email Address" would like to share the life celebration of Clinton Ray Alvin Springer. Click on the "link" to go to share a favorite memory or leave a condolence message for the family.